Personal computers (PCs) have historically been built with a central processing unit - better known as a CPU, which is considered the brains of the computer - installed on to a motherboard. A separate chip or add-in card has been used to provide the video/gaming processing and signal from the PC to a monitor. In recent times, this video chip, known as a GPU, has been added to the motherboard on low-cost computers. While not powerful enough to run the latest games - you will need what's known as a discrete card for full-on gaming - this type of integrated video is found on practically all corporate PCs, where the primary function is to display simple 2D applications such as spreadsheets and web pages. There are two main chip-makers for the consumer and business PC markets: Intel and AMD. Appreciating that high-definition video playback and general multimedia usage are becoming must-have functions on a modern computer, both companies have worked towards bringing the video-processing chip and CPU together, right on to one chip. AMD has now successfully mated the integrated video and CPU on to one bit of silicon for both the low-end and mainstream PC markets. The company refers to these processors as APUs (Accelerated Processing Units). The cheaper APUs run with the code-name Brazos, while the mainstream video-and-CPU chip, released in June 2011, is known as Llano. A range of Llano APUs is available for both laptop and desktop PCs. The two sets of Llano processor share the same underlying technology, and we'll be focussing on the desktop variant in this guide. Initially, AMD is releasing four Llano models for desktop PCs. While Llano is the code-name, the mainstream-orientated APU chips are productised as the AMD A-series. The first two off the bat are the A6 and A8, as shown in the table, below. The A6 and A8 chips have four CPU processing cores whose technology is very similar to existing (CPU-only) AMD Phenom II's, which have been on sale for a couple of years now. This means they're based around what's known as the K10 architecture and, generally speaking, have adequate performance for everyday tasks. But the CPU is only one part of the equation with APUs; AMD also adds in a graphics portion to each chip. A6 and A8 APUs' graphics are also based on largely existing technology. Simplifying it somewhat, they use the graphics core found on low-end Radeon HD 5-series cards that you would normally slot into a motherboard. Understanding the provenance of the APUs' graphics means they can play the very latest (DX11) games at reasonable image-quality settings. What's more, AMD tacks onto each APU its latest UVD technology. This tiny bit of silicon enables the chips to run, smoothly, the latest high-definition video content - Blu-ray films, HD DivX content, for example - with low overall power consumption. 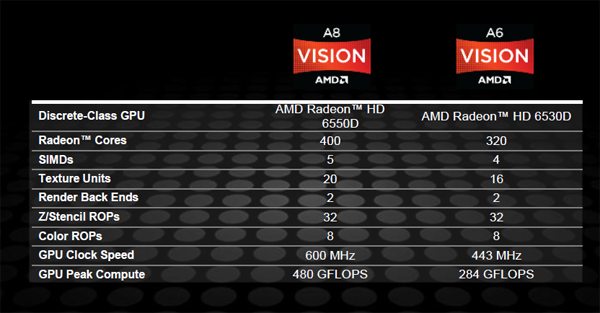 As the tables show, the A6 APU is a scaled-down version of the A8. It has a slower graphics core and lower CPU speeds. Just like the A8, it's available in 65W and 100W versions, where the higher-wattage APU is geared more for performance than power efficiency. Understanding AMD's APUs is quite simple: they bring together existing mainstream AMD CPU and graphics technology and package it into one chip. The technology juggling required to achieve this feat means the APUs require a new motherboard and chipset socket, FM1, and partners such as Gigabyte, MSI and ASUS all have APU-supporting desktop boards in the marketplace right now. A fully-featured FM1 board, costing some £75, incorporates dual-channel DDR3 memory at up-to 1,866MHz speeds, SATA 6Gbps storage connectivity and USB 3.0 as standard. It can also pair an add-in Radeon graphics cards with the on-APU graphics for increased 3D performance through a technology called Dual Graphics. AMD markets these all-in-one chips aggressively. The top-line A8-3850 is currently available for £100, while the A6-3600 is due to be launched for £70. Factor in the motherboard and 4GB of DDR3 RAM and a barebone, APU-centric PC can be built for £200. Reputable hardware review websites have shown that the performance of this combination is good enough for general computing, high-definition multimedia consumption and casual gaming. Intel, too, has processors that couple the CPU and GPU on to one chip. Known as second-generation Core and evaluated on a price-to-price basis against AMD's nascent APUs, Intel's chips tend to be stronger for CPU functions and weaker for the corresponding 2D and 3D video performance. AMD and Intel have both demonstrated they have the technology wherewithal to manufacture processors that combine the CPU and GPU parts of a traditional computer. This important fact means that we'll no longer see CPU-only chips for the mainstream PC market. AMD's APU approach centres around a quartet of A-series desktop chips which, for a sub-£100 outlay, have adequate CPU performance and above-average video credentials. Looking for an inexpensive PC that has most of the bases covered? You'd do well to take a keen interest in AMD's APU technology.